SIR: I have the honor to submit this my report of the operations of my brigade during the action of the 21st instant. The brigade is composed of the Thirteenth New York Volunteers, Colonel Quinby; Sixty-ninth New York, Colonel Corcoran; Seventy-ninth New York, Colonel Cameron; Second Wisconsin, Lieutenant-Colonel Peck, and Company E, Third Artillery, under command of Capt. R. B. Ayres, Fifth Artillery. We left our camp near Centreville, pursuant to orders, at 2.30 a.m., taking place in your column next to the brigade of General Schenck, and proceeded as far as the halt before the enemy's position near the stone bridge at Bull Run. Here the brigade was deployed in line along the skirt of timber, and remained quietly in position till after 10 a.m. The enemy remained very quiet, but about that time we saw a regiment leave its cover in our front and proceed in double-quick time on the road toward Sudley Springs, by which we knew the columns of Colonels Hunter and Heintzelman were approaching. About the same time we observed in motion a large force of the enemy below the stone bridge. I directed Captain Ayres to take position with his battery near our right and open fire on this mass, but you had previously detached the two rifled guns belonging to this battery, and finding the smoothbore guns did not reach the enemy's position we ceased firing, and I sent a request that you should send to me the 30-pounder rifled gun attached to Captain Carlisle's battery. At the same time I shifted the New York Sixty-ninth to the extreme right of the brigade. Thus we remained till we heard the musketry fire across Bull Run, showing that the head of Colonel Hunter's column was engaged. 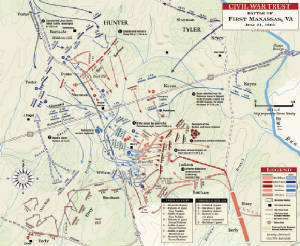 This firing was brisk, and showed that Hunter was driving before him the enemy till about noon, when it became certain the enemy had come to a stand, and that our forces on the other side of Bull Run were all engaged----artillery and infantry. Here you sent me the order to cross over with the whole brigade to the assistance of Colonel Hunter. Early in the day, when reconnoitering the ground, I had seen a horseman descend from a bluff in our front, cross the stream, and show himself in the open field, and, inferring we could cross over at the same point, I sent for ward a company as skirmishers, and followed with the whole brigade, the New York Sixty-ninth leading. We found no difficulty in crossing over, and met no opposition in ascending the steep bluff opposite with our infantry, but it was impassable to the artillery, and I sent word back to Captain Ayres to follow if possible, otherwise to use his discretion. Captain Ayres did not cross Bull Run, but remained with the remainder of your division. His report, herewith, [No. 27], describes his operations during the remainder of the day. Advancing slowly and cautiously with the head of the column, to give time for the regiments in succession to close up their ranks, we first encountered a party of the enemy retreating along a cluster of pines. Lieutenant-Colonel Haggerty, of the Sixty-ninth, without orders, rode out and endeavored to intercept their retreat. One of the enemy, in full view, at short range, shot Haggerty, and he fell dead from his horse. The Sixty-ninth opened fire upon this party, which was returned; but, determined to effect our junction with Hunter's division, I ordered this fire to cease, and we proceeded with caution toward the field, where we then plainly saw our forces engaged. Displaying our colors conspicuously at the head of our column, we succeeded in attracting the attention of our friends, and soon formed the brigade in rear of Colonel Porter's. 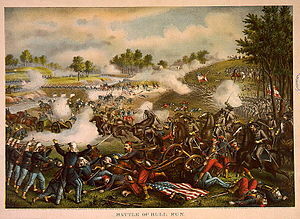 Here I learned that Colonel Hunter was disabled by a severe wound, and that General McDowell was on the field. I sought him out, and received his orders to join in the pursuit of the enemy, who was falling back to the left of the road by which the Army had approached from Sudley Springs. Placing Colonel Quinby's regiment of rifles in front, in column by divisions, I directed the other regiments to follow in line of battle, in the order of the Wisconsin Second, New York Seventy-ninth, and New York Sixty-ninth. Quinby's regiment advanced steadily down the hill and up the ridge, from which he opened fire upon the enemy, who had made another stand on ground very favorable to him, and the regiment continued advancing as the enemy gave way, till the head of the column reached the point near which Ricketts' battery was so severely cut up. The other regiments descended the hill in line of battle under a severe cannonade; and the ground affording comparative shelter against the enemy's artillery, they changed direction by the right flank and followed the road before mentioned. At the point where this road crossed the ridge to our left front, the ground was swept by a most severe fire of artillery, rifles, and musketry, and we saw in succession several regiments driven from it, among them the zouaves and battalion of marines. Before reaching the crest of this hill the roadway was worn deep enough to afford shelter, and I kept the several regiments in it as long as possible; but when the Wisconsin Second was abreast of the enemy, by order of Major Wadsworth, of General McDowell's staff, I ordered it to leave the roadway by the left flank, and to attack the enemy. This regiment ascended to the brow of the hill steadily, received the severe fire of the enemy, returned it with spirit, and advanced delivering its fire. This regiment is uniformed in gray cloth, almost identical with that of the great bulk of the secession army, and when the regiment fell into confusion and retreated toward the road there was an universal cry that they were being fired on by our own men. The regiment rallied again, passed the brow of the hill a second time, but was again repulsed in disorder. All this time Quinby's regiment occupied another ridge to our left, overlooking the same field of action and similarly engaged. On the ridge to the west we succeeded in partially reforming the regiments, but it was manifest they would not stand, and I directed Colonel Corcoran to move along the ridge to the rear, near the position where we had first formed the brigade. General McDowell was there in person, and used all possible efforts to reassure the men. By the active exertions of Colonel Corcoran we formed an irregular square against the cavalry, which were then seen to issue from the position from which we had been driven, and we began our retreat towards that ford of Bull Run by which we had approached the field of battle. There was no positive order to retreat, although for an hour it had been going on by the operation of the men themselves. The ranks were thin and irregular, and we found a stream of people strung from the hospital, across Bull Run and far towards Centreville. After putting in motion the irregular square, I pushed forward to find Captain Ayres' battery. Crossing Bull Run, I sought it at its last position before the brigade crossed over, but it was not there; then, passing through the woods where in the morning we had first formed line, we approached the blacksmith-shop, but there found a detachment of the secession cavalry, and thence made a circuit, avoiding Cub Run Bridge, into Centreville, where I found General McDowell. From him I understood it was his purpose to rally the forces, and make a stand at Centreville. But, about 9 o'clock at night, I received, from General Tyler in person the order to continue the retreat to the Potomac. This retreat was by night, and disorderly in the extreme. The men of different regiments mingled together, and some reached the river at Arlington, some at Long Bridge, and the greater part returned to their former camps at or near Fort Corcoran. I reached this point at noon the next day, and found a miscellaneous crowd crossing over the Aqueduct and ferries. I herewith inclose the official report of Captain Kelly, the commanding officer of the Sixty-ninth New York; also full lists of the killed, wounded, and missing. Our loss was heavy, and occurred chiefly at the point near where Ricketts' battery was destroyed. Lieutenant-Colonel Haggerty was killed about noon, before we effected a junction with Colonel Hunters division. Colonel Cameron was mortally wounded leading his regiment in the charge, and Colonel Corcoran has been missing since the cavalry charge near the building used as a hospital.